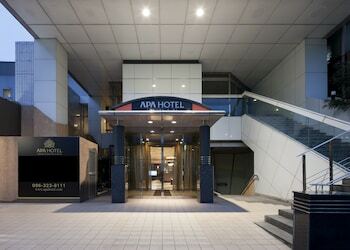 A stay at APA Hotel Kumamoto-Kotsu-Center- Minami places you in the heart of Kumamoto, steps from Ryukyu Islands and Former Hosokawa Residence. Featured amenities include complimentary wired Internet access, dry cleaning/laundry services, and luggage storage. When you a stay at Kamiobo in Kobe, you'll be in the historical district, just steps from Arima Hot Springs and Arima Toy Museum. Free self parking is available onsite. With a stay at Silver Birch in Kutchan, you'll be within a 15-minute drive of Niseko Mountain Resort Grand Hirafu and Lake Hangetsu Nature Park. With a stay at Beach Front Hamby in Chatan, you'll be near the beach, just a 1-minute walk from Ryukyu Islands and 10 minutes by foot from Araha Beach. Free self parking is available onsite.